One of my favorite signature New York eats is the black and white cookie. When made correctly, they are essentially flat pieces of cake with vanilla and chocolate icing on top. Delicious! 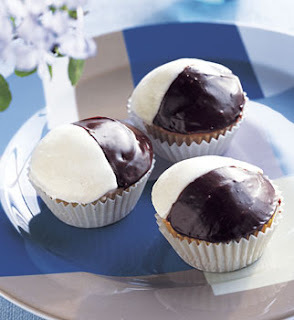 This recipe from Bon Appetit is black and white cookie meets cupcake and it looks like it will be a very tasty endeavor. Hello Black and White Cupcakes! Bring cream and corn syrup just to simmer in heavy small saucepan over medium heat. Remove from heat. Add chocolate and vanilla; whisk until melted and smooth. Whisk all ingredients in small bowl to blend. Let both icings stand 1 1/2 hours at room temperature to thicken. Preheat oven to 325°F. Line 12-cup muffin tin with paper liners. Whisk eggs, vanilla, and lemon peel in medium bowl to blend. Mix cake flour, baking powder, and salt in another medium bowl. Using electric mixer, beat sugar and butter in large bowl until well blended, stopping occasionally to scrape down sides of bowl. Gradually beat in egg mixture. Beat in dry ingredients alternately with buttermilk in 2 additions each. Divide batter among cups. Bake until tester inserted into centers comes out clean, about 25 minutes. Cool cupcakes in pan on rack 5 minutes. Remove cupcakes from pan and cool completely. Your icing looks so neat on the cupcake...how did you get it from spilling over the sides?